Tom Clancy's The Division is a massive, open-world, online, third-person shooter that is being developed by Ubisoft in the Tom Clancy franchise for Xbox One, PS4, and PC. 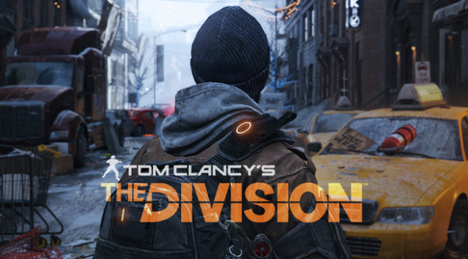 The Division was revealed at E3 in 2013, and it is set to be released in 2015. The game has made such a groundbreaking debut, it is already one of the most anticipated games of 2015, which is surprising, considering we don't really know a whole lot about it. Along with the reveal at the E3 press conference, came a largely impressive gameplay trailer, to showcase just what the game is all about. The basis of this game, is that New York City has been hit by a "deadly pandemic" (AKA a government experiment gone wrong) on Black Friday, leading to chaos; making survival necessary. Now, this may seem a little odd, or perhaps it might not make sense at all, however, if you watch the video below, the plot will become a little more clear. After the opening sequence, we get to see a relatively short gameplay demonstration of a team of three players travel just a small part of this big, open world. Once the three players have all joined together, they hear gunshots nearby, and decide to head for the police station. Upon arriving at the police station, they discover there are (AI) enemies inside, which leads to a sprawling gunfight, just outside. Luckily, they are joined by a friend, who is using a tablet to play with them. The tablet support offers the player squads an aerial advantage, by using a drone (of sorts) to "spot" enemies, and it is also capable of firing missiles! Teamwork seems to be a key theme in The Division, so if you want to not only survive, but thrive, teamwork is a must, not only against the AI, but also against other players. (Yes, this game also has PvP aspects). However, the trailer is not all about gunplay and shooting people; it's also about teamwork, and really showing the game off. The game itself, in my opinion, looks very impressive, and very detailed. I don't mean detailed only as in the way it looks, but I also looks like it is well thought out. Your character is capable of choosing and/or buying different skills that will aid your squad in battle (such as small turrets, and healing team members). The world is dynamic and susceptible to change; for example, if you shoot through a billboard, the sun rays will beam through the bullet holes, or if you shoot through a window, it won't smash straight away, but instead it will have bullet holes. The weather changes too, which adds diversity, immersion, and reality to the feel over all feel and experience. This means that there will not always be snow, so if there is any, don't expect it to stay for too long, as it will melt away. Fans of customization will be happy, because Ubisoft has confirmed that there are no "predetermined hero sets", meaning that you can customize your character from the very beginning of the game. The depth of customization is currently unknown, but I'm sure most will agree; sometimes a little is better than none. Not as much of a PvP fan? Well, that's just fine, if you're within a "Green Zone". A "Green Zone" is a place you might find during your journey in The Division. It is a "Safe Zone", if you like. This means that there is no PvP here, but instead it's a more "friendly" area, where you can meet other players and trade items. Screenshot from the 2014 gameplay trailer. However, if PvP is your thing, I personally believe you might be in for a treat. Taking in to consideration that while squads can only be a maximum of four people, that doesn't mean you might only face off against four. I'm sure that you don't have to kill other squads, meaning if you had a friend, and they had friends (and so on), you could travel as a pack of eight, and vice versa. PvP could be more varied than we first thought. Although it is currently unclear on just what can be traded, Ubisoft have confirmed that trading is going to have a "strong presence" within The Division. This could mean that you can trade gear, such as weapons, or you could trade supplies, such as food and water, with other players. Like a safe foothold/point in NYC for you and/or your group. Base "modules" that you can bring online to aid your team. What you do in the area will have an effect on your base and/or the benefits it brings. You can fast travel from your base. The release date for The Division is currently unknown. All we know is 2015. (This is the official 2014 trailer). (This is the official 2014 gameplay). There is no doubt that there will be more shown in the coming months. Tom Clancy's The Division uses the Snowdrop engine, for those that are curious. What are your thoughts on Tom Clancy's The Division? Will you be getting this game?